Magic, Games, and Sing-A-Longs, What More Can You Ask for? Mary Macaroni returns to the World’s Largest Laundromat entertaining children with games, sing-alongs, and magic. It was held on Wednesday from 5p.m.-7p.m. World’s Largest Laundromat is located at 6246 Cermak Rd., Berwyn, IL, hosting events that incorporate children to interact and makes it a much fun and easier way for parents to do laundry. Their children stay entertained. The Green Mile Pub Crawl gives revelers a chance to get a jump on St. Patrick’s Day with a March 13 party along Berwyn’s Roosevelt Road. Don’t expect too many marching bands, however. Organizer John Aranza said it will highlight Roosevelt Road as a “destination point”. Local businesses, such as Fitzgerald’s, Big Guys Sausage, Autre Monde, and others will host special music performances and food and drink specials for the evening. And this year the organizers are going to showcase more musical acts, including the Band of Brothers Pipes and Drums. The Pub Crawl is set to kick off on Friday, March 13 at 5 p.m. and going to 11 p.m. Wristbands for the event costs $10 and include a shuttle service down Roosevelt Road as well as drink specials at participating venues. 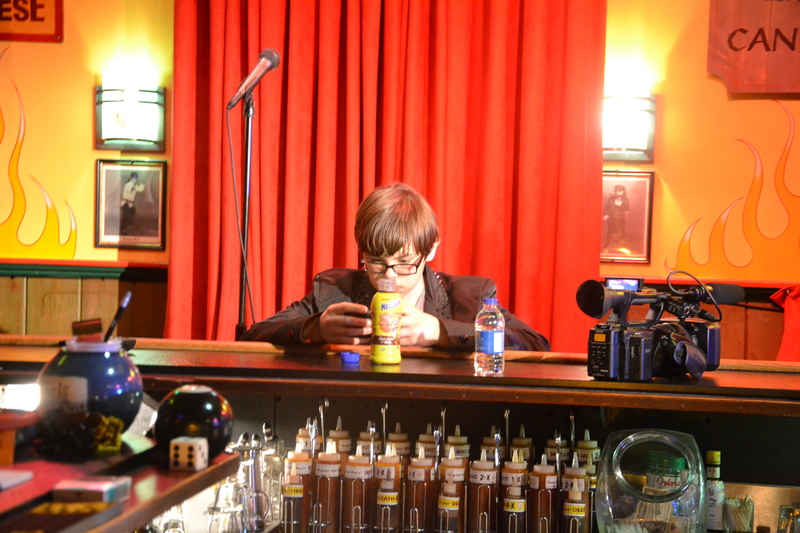 While most of the crowd at Cigar and Stripes BBQwere enjoying beers, 12-year-old Trevor Burke was sipping chocolate milk waiting to perform. On Feb. 5 comedian Trevor Burke filmed the pilot for his new reality TV show at the neighborhood restaurant and bar in Berwyn.With cameras, microphones, and directors on deck Cigar and Stripes BBQ looked more like a Hollywood movie set. “I’m kind of transforming from a kid doing stand-up comedy and acting into something huge,” said Trevor. The show will follow Trevor’s journey to perform comedy while often being rejected by clubs because of his age. Trevor, a St. Charles resident, is only 12-years-old, most clubs have a 21 and over age restriction. Trevor said his humor appeals more to adults than children. Trevor Burke taking a break and playing on his phone. Scott Lucas & the Married Men will be playing at Wire in Berwyn Friday, Nov. 22. The Chicago Tribune listed their album “Blood Half Moon” in the top 10 indie releases of 2012, according to Mango Media Manager Jill Mango. 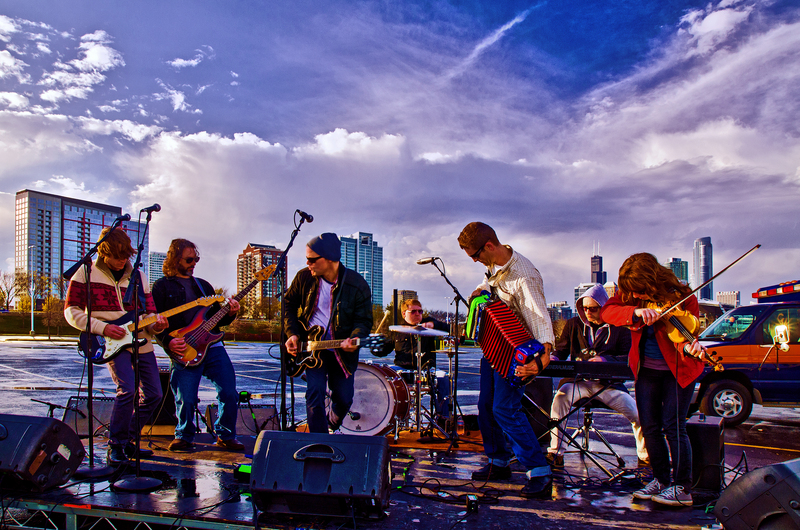 Lucas describes the group’s evolving sound as “country-ish, alt-rock for people who like metal.” The band also incorporates violin, organ and accordion into their music. Scott Lucas & the Married Men toured with Deer Tick last summer and played shows with James Iha, Kelly Hogan, Tristen, the Airborne Toxic Event and others in the past year. Lucas, originally from Zion, Ill., is best known as the singer and guitarist for a two-man, Chicago rock band called Local H. For his solo records, he plays with the Married Men. Reviewers have compared this band to American Music Club, Wilco, the Waterboys and Nick Cave. Wire is located at 6815 W. Roosevelt Rd. in Berwyn.